The last time I posted about quilting snow was on the ground and it was so cold. Now in mid summer it is so hot. And I am back to stitching a quilt. 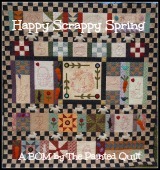 Amy from Sew Incredibly Crazy published her first quilt pattern and was looking for pattern testers. A new experience for me. 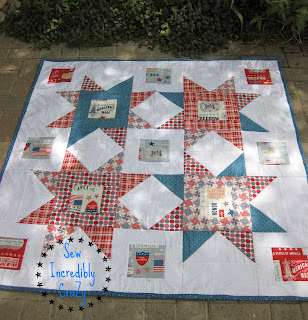 Her Watkins Star Quilt is lovely and worked up perfectly. it is available here. I choose a FQ bundle full of sunshine colors. This was a fun pattern to stitch. What is really neat is seeing how pretty and unique looking a pattern can be when different fabrics are chosen. Check out Amy's blog to see all the variations. This quilt has so much potential. I can see it stitched in winter fabrics with a sky blue background. This was such a fun quilt to make and it's even more fun seeing how the other testers have made theirs looks so different by choosing different fabrics. Love your colours. It would be great to have four, one for each season. Very pretty! I love your bright fabrics! Just gorgeous!! You selected just the right line of fabrics. I love seeing flimsies hanging outside, with the sun giving them that stained glass look.